Atherosclerosis is a progressive disease characterized by inflammation and accumulation of lipids in vascular tissue. Porphyromonas gingivalis (Pg) and Chlamydia pneumoniae (Cp) are associated with inflammatory atherosclerosis in humans. Similar to endogenous mediators arising from excessive dietary lipids, these Gram-negative pathogens are pro-atherogenic in animal models, although the specific inflammatory/atherogenic pathways induced by these stimuli are not well defined. 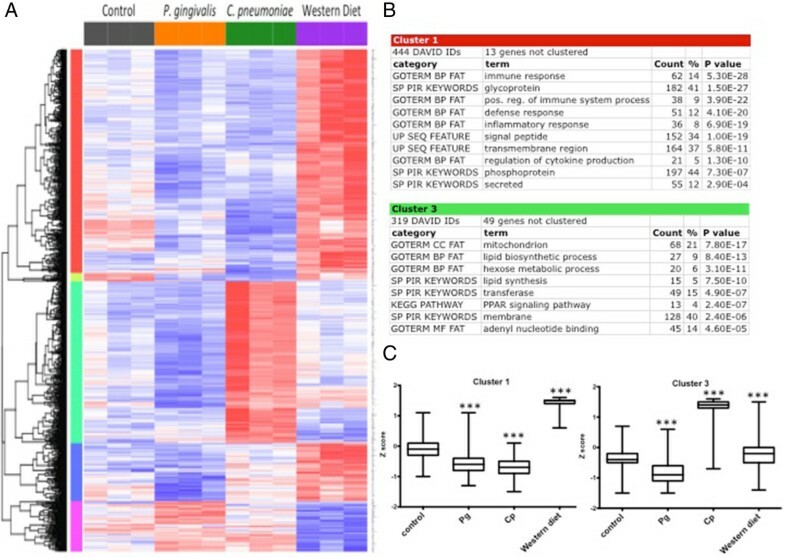 In this study, we identified gene expression profiles that characterize P. gingivalis, C. pneumoniae, and Western diet (WD) at acute and chronic time points in aortas of Apolipoprotein E (ApoE-/-) mice. 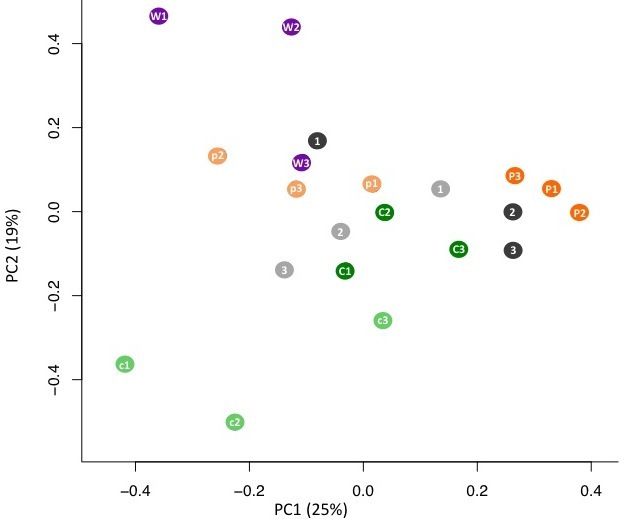 At the chronic time point, we observed that P. gingivalis was associated with a high number of unique differentially expressed genes compared to C. pneumoniae or WD. For the top 500 differentially expressed genes unique to each group, we observed a high percentage (76%) that exhibited decreased expression in P. gingivalis-treated mice in contrast to a high percentage (96%) that exhibited increased expression in WD mice. C. pneumoniae treatment resulted in approximately equal numbers of genes that exhibited increased and decreased expression. Gene Set Enrichment Analysis (GSEA) revealed distinct stimuli-associated phenotypes, including decreased expression of mitochondrion, glucose metabolism, and PPAR pathways in response to P. gingivalis but increased expression of mitochondrion, lipid metabolism, carbohydrate and amino acid metabolism, and PPAR pathways in response to C. pneumoniae; WD was associated with increased expression of immune and inflammatory pathways. DAVID analysis of gene clusters identified by two-way ANOVA at acute and chronic time points revealed a set of core genes that exhibited altered expression during the natural progression of atherosclerosis in ApoE-/- mice; these changes were enhanced in P. gingivalis-treated mice but attenuated in C. pneumoniae-treated mice. Notable differences in the expression of genes associated with unstable plaques were also observed among the three pro-atherogenic stimuli. 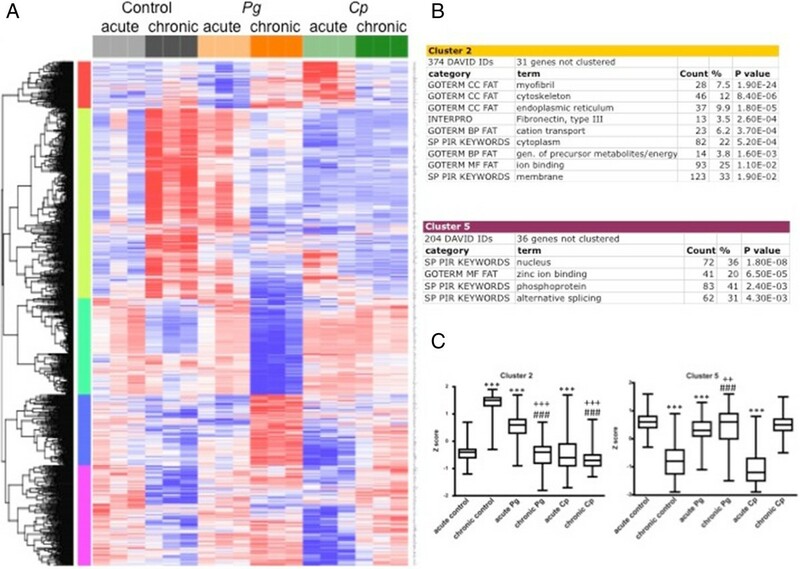 Despite the common outcome of P. gingivalis, C. pneumoniae, and WD on the induction of vascular inflammation and atherosclerosis, distinct gene signatures and pathways unique to each pro-atherogenic stimulus were identified. Our results suggest that pathogen exposure results in dysregulated cellular responses that may impact plaque progression and regression pathways. Atherosclerosis is a chronic disease characterized by endothelial dysfunction and inflammation [1–3]. In addition to the significant monetary burden, atherosclerotic vascular disease undermines functional capacity, leads to a greater dependence on hospitalizations and long-term care, and is a risk factor for the development of myocardial infarction and heart failure . A greater understanding of mechanisms and mediators of vascular dysfunction and inflammatory processes in the aortic vasculature that manifest as atherosclerotic disease are needed in order to promote the development of novel prevention and treatment strategies. Clinical studies have shown that atherosclerotic plaque in the aortic arch and innominate arteries is commonly observed in patients at risk for stroke, myocardial infarction, atrial fibrillation, and peripheral artery disease and that plaque in the aorta is an indication of generalized atherosclerosis . While retention of lipoprotein into the sub-endothelial vascular layer is believed to be the initiating stimulus leading to the development of atherosclerosis, activation of multiple pathways related to vascular inflammation and dysfunction sustain the process by stimulating recruitment of leukocytes and immune cells into the sub-endothelial layer . Differentiation of monocytes into tissue resident macrophages that engulf and oxidize lipids to become inflammatory foam cells is also a hallmark of atherosclerosis . One of the well-defined risk factors for the development of atherosclerosis is diet-induced obesity, which is on the rise in Western societies . Mounting evidence in humans supports an etiological role for the microbiota in inflammatory atherosclerosis. Recent studies have established that common chronic infections may account for up to 40% of newly developed atherosclerosis independent of genetic risk factors . The Gram-negative bacteria, Porphyromonas gingivalis (P. gingivalis) and Chlamydia pneumoniae (C. pneumoniae), have been associated with the development and acceleration of plaque burden in humans and these observations have been validated in animal models [1, 6–19]. Both of these pathogens have a high prevalence of infection in the general population. P. gingivalis is an oral pathogen strongly associated with periodontal disease, one of the most common chronic diseases with a prevalence between 10-60% of adults . 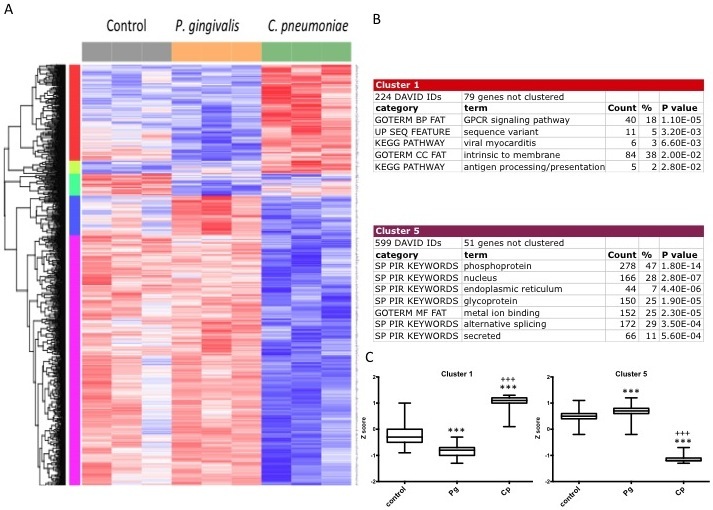 P. gingivalis promotes chronic systemic inflammation by disrupting host immune responses and altering the composition of microbial communities [21–24]. C. pneumoniae is an obligate intracellular bacterium that infects the respiratory tract and is a major cause of pneumonia in humans. An estimated 2-5 million cases of pneumonia each year in the United States are attributed to C. pneumoniae infection . Approximately 50% of adults have evidence of past infections by age 20 and re-infection throughout life is common . Although extensive research has shown endogenous mediators arising from excessive dietary lipids and the pathogens P. gingivalis and C. pneumoniae are pro-atherogenic [5, 8, 9, 12, 13], the specific inflammatory/atherogenic pathways induced by these individual stimuli in plaque progression are not well defined. In this study, we examined how exposure to two pathogens associated with atherosclerosis induces modulation of gene expression in aortic tissues using ApoE-/- mice that spontaneously develop atherosclerosis in the absence of an additional pro-atherogenic stimulus. ApoE-/- mice are the most widely used mouse model for the development of atherosclerosis in the absence of additional stimuli and are characterized by increased total plasma cholesterol levels [1, 26–28]. Furthermore, we compared pathogen-induced gene signatures to ApoE-/- mice fed a Western diet. Comparison of gene expression profiles obtained from pathogen treated mice at the acute and chronic time points was also examined to define how these pathogens modulate gene expression during the natural progression of atherosclerosis in ApoE-/- mice. Principal Component Analysis (PCA, Additional file 1: Figure S1) performed using all genes across all samples showed that there was strong separation between chronic and acute P. gingivalis treatment samples (dark and light orange) along the PC1 axis, indicating that there was strong time-dependent differential gene expression in this treatment group. 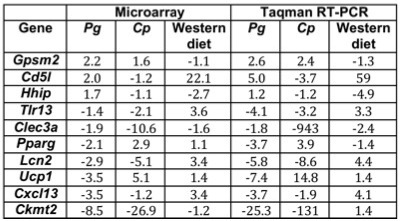 Mean fold changes (relative to chronic control) obtained by Taqman real time RT-PCR analysis for 10 genes were in good agreement with microarray results (Additional file 2: Table S1 and Additional file 3: Figure S2). 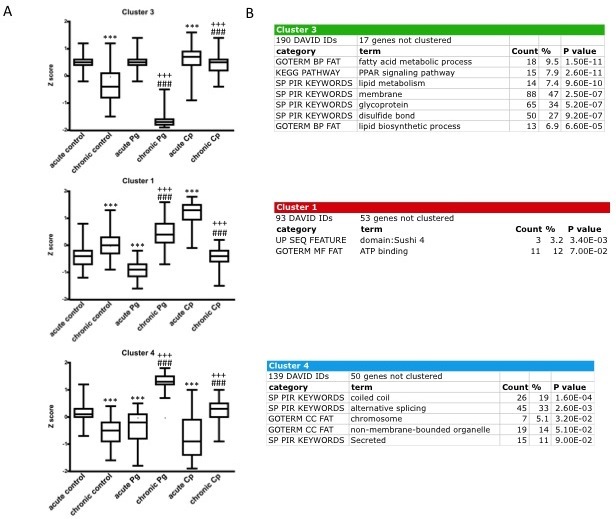 Genes with significant differential expression (FDR q < 0.25) in response to the three pro-atherogenic stimuli are tabulated in Figure 1. P. gingivalis treatment resulted in a 2-3 times greater number of unique differentially expressed genes compared to the other two treatments. The number of differentially expressed genes common to the two pathogen-treated groups was also substantially larger than the number common to either pathogen-treated group and the WD group. Chronic time point Venn diagrams. Venn diagrams depicting the number of genes with significantly increased (left) or significantly decreased (right) expression vs. the chronic control group for each chronic treatment group. The sets of differentially expressed genes result from differential expression analyses for each chronic treatment group vs. the chronic control group using the R environment for statistical computing (version 2.15.1) with a cut off of FDR q < 0.25 as described in Methods. To provide insight into the biological pathways and processes that are altered in response to each treatment, we used Gene Set Enrichment Analysis (GSEA) [29–31] to determine whether the members of gene sets involved in curated pathways and processes (as obtained from the Molecular Signatures Database, MSigDB) were nonrandomly distributed across all genes interrogated by the array with respect to each treatment. The gene sets that were coordinately upregulated (positively enriched) in response to P. gingivalis were related to proliferative signaling, matrix remodeling, execution of apoptosis, PDGF signaling, the secretin G-protein receptor family, and the lysosome (Table 1 and Additional file 4: Table S2). The gene sets with the strongest coordinate downregulation (negative enrichment) with P. gingivalis treatment were involved in mitochondrial function and glucose metabolism (Table 2 and Additional file 4: Table S3), suggesting that P. gingivalis treatment may lead to mitochondrial dysfunction and metabolic imbalance in the aorta. C. pneumoniae treatment was associated with the coordinate upregulation of genes involved in redox signaling, lipid metabolism, carbohydrate and amino acid metabolism, the mitochondrion, and vitamin metabolic processes (Table 3 and Additional file 4: Table S4), and the downregulation of genes related to muscle contraction and differentiation and channel activity (Table 4 and Additional file 4: Table S5). These findings suggest that C. pneumoniae treatment alters the redox state and metabolism of lipids that may promote the dedifferentiation of smooth muscle cells in aortic tissue. The majority of gene sets that were coordinately upregulated in response to WD were those involved in defense and immune function; others included pathways related to macromolecular degradation and cell cycle regulation (Table 5 and Additional file 4: Table S6). Gene sets that were negatively enriched in response to WD included tight junction regulation, receptor signaling, muscle proteins and channel activity (Table 6 and Additional file 4: Table S7). These findings suggest that dietary lipids and cholesterol are sensed by the innate and adaptive immune system in aortic tissue in a manner that promotes inflammation and loss of vascular barrier function. Positive enrichment: chronic P. gingivalis-treated group vs. chronic control group. The top 25 P. gingivalis gene sets whose member genes are predominantly upregulated with respect to the chronic control group. Column 1 indicates the rank of the gene set based on Normalized Enrichment Score (NES). Column 2 lists the gene set name (bold) as provided by MSigDB. Gene set names and ranks that are not in bold are gene sets that are redundant or partially redundant and included within larger bolded gene sets. The NES ranged from 2.32 (for Basal Cell Carcinoma, the top ranked gene set) to 1.66 (REACTOME Class B2 Secretin Family Receptors, the 25th-ranked gene set). FDR q range: 0.001-0.186. Negative enrichment: chronic P. gingivalis-treated group vs. chronic control group. The top 25 P. gingivalis gene sets whose member genes are predominantly downregulated with respect to the chronic control group. Column 1 indicates the rank of the gene set based on Normalized Enrichment Score (NES). Column 2 lists the gene set name (bold) as provided by MSigDB. Gene set names and ranks that are not in bold are gene sets that are redundant or partially redundant and included within larger bolded gene sets. The NES ranged from -3.24 (for REACTOME Integration of Energy Metabolism, the top ranked gene set) to -2.33 (KEGG PPAR Signaling Pathway, the 25th-ranked gene set). FDR q < 1 × 10-30. Positive enrichment: chronic C. pneumoniae-treated group vs. chronic control group. The top 25 C. pneumoniae gene sets whose member genes are predominantly upregulated with respect to the chronic control group. Column 1 indicates the rank of the gene set based on Normalized Enrichment Score (NES). Column 2 lists the gene set name (bold) as provided by MSigDB. Gene set names and ranks that are not in bold are gene sets that are redundant or partially redundant and included within larger bolded gene sets. The NES ranged from 2.64 (for Microbody Peroxisome, the top ranked gene set) to 2.03 (Vitamin Metabolic Process, the 25th-ranked gene set). FDR q range: 0-0.001. Negative enrichment: chronic C. pneumoniae-treated group vs. chronic control group. The top 25 C. pneumoniae gene sets whose member genes are predominantly downregulated with respect to the chronic control group. Column 1 indicates the rank of the gene set based on Normalized Enrichment Score (NES). Column 2 lists the gene set name (bold) as provided by MSigDB. Gene set names and ranks that are not in bold are gene sets that are redundant or partially redundant and included within larger bolded gene sets. The NES ranged from -2.79 (for KEGG Hypertrophic Cardiomyopathy, the top ranked gene set) to -2.23 (Regulation of Muscle Contraction, the 25th-ranked gene set). FDR q < 1 × 10-30. Positive enrichment: Western diet group vs. chronic control group. The top 25 Western diet gene sets whose member genes are predominantly upregulated with respect to the chronic control group. Column 1 indicates the rank of the gene set based on Normalized Enrichment Score (NES). Column 2 lists the gene set name (bold) as provided by MSigDB. Gene set names and ranks that are not in bold are gene sets that are redundant or partially redundant and included within larger bolded gene sets. The NES ranged from 2.97 (for KEGG Lysosome, the top ranked gene set) to 2.42 (REACTOME Cell Cycle Checkpoints, the 25th-ranked gene set). FDR q < 1 × 10-30. Negative enrichment: Western diet group vs. chronic control group. The top 25 Western diet gene sets whose member genes are predominantly downregulated with respect to the chronic control group. Column 1 indicates the rank of the gene set based on Normalized Enrichment Score (NES). Column 2 lists the gene set name (bold) as provided by MSigDB. Gene set names and ranks that are not in bold are gene sets that are redundant or partially redundant and included within larger bolded gene sets. The NES ranged from -3.43 (for G Protein Coupled Receptor Activity, the top ranked gene set) to -1.92 (Digestion, the 25th-ranked gene set). FDR q range: 0 – 0.015. 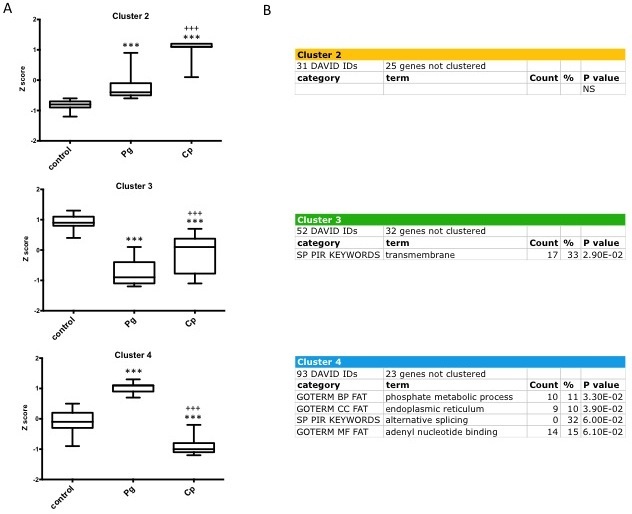 The 1000 genes with the greatest significance by one-way ANOVA across the four chronic treatment groups (control, P. gingivalis, C. pneumoniae, and WD) were assigned to several groups using hierarchical clustering (Figure 2A-C). At the arbitrary cutoff of 1000 genes, the chronic time point ANOVA FDR q value was < 0.019 and the p value was < 8.73 × 10-4. The DAVID functional classification tool was used to extract biological meaning from each of the clusters (Figure 2B). The three pro-atherogenic stimuli produced strikingly different patterns of differential gene expression. Genes involved in immunity and inflammation (Cluster 1) were coordinately upregulated in response to WD, but were largely unchanged in response to either pathogen. 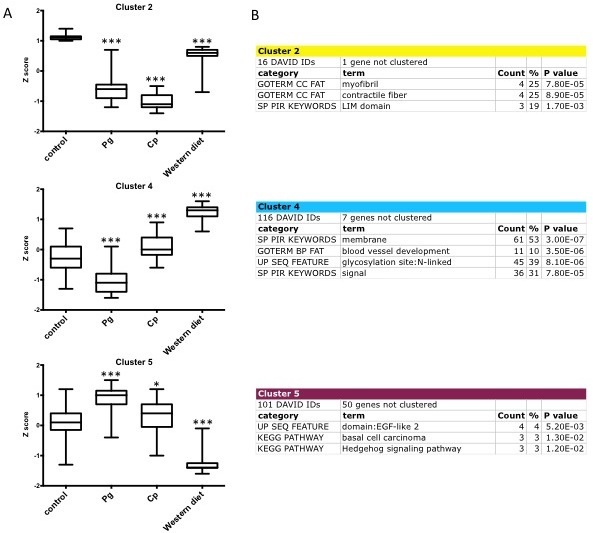 By contrast, genes involved in lipid synthesis and PPAR signaling (Cluster 3) were markedly increased in response to C. pneumoniae treatment but were unchanged in the other groups. Finally, two smaller clusters suggest that the Hedgehog pathway is suppressed in WD mice (Cluster 5) and that treatment with either pathogen decreased the expression of contractile proteins (Cluster 2); however, these results were based on a small number of genes and should be interpreted with caution (Figure 2A and Additional file 5: Figure S3A and B). Chronic time point cluster analysis. The top 1000 differentially expressed genes at the chronic time point with 5 distinct clusters. A. Heat map shows relative expression among all groups. Clusters are color-coded by row sidebars: red (cluster 1), chartreuse (cluster 2), mint green (cluster 3), blue (cluster 4), and magenta (cluster 5); and dendrogram is left of the color-coded sidebars. Each row corresponds to a gene (gene symbols are listed to the right of each row) and each column to a sample. The colors are scaled by row; red and blue indicate 2 standard deviations above or below the mean (white), respectively. At the arbitrary cutoff of 1000 genes, the chronic time point one-way ANOVA FDR q value was < 0.019 and the p value was < 8.73 × 10-4. B. DAVID analysis of clusters 1 and 3. Gene enrichment is indicated by p values (EASE scores, a modified Fisher exact p value). C. Box and whisker plots of the mean expression (log2) for Clusters 1 and 3 reflect patterns seen on heat map. *** = p < 0.0001 chronic treatment group vs. chronic control group by Mann-Whitney test. To examine the acute response in aortic tissue following pathogen exposure, RNA samples were obtained one day after the last treatment with P. gingivalis or C. pneumoniae (see Methods). 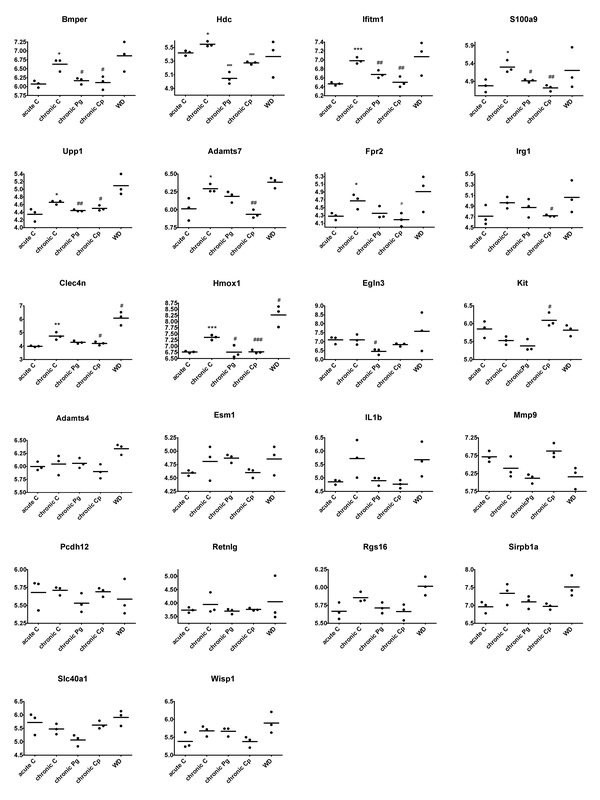 Genes with nominally significant differential expression (p < 0.05) between the chronic and acute time points in untreated or P. gingivalis- or C. pneumoniae-treated ApoE-/- mice are tabulated in Figure 3. Differential expression in all three groups was greater than expected by chance, and as in the comparison between groups at the chronic time point alone (Figure 1), P. gingivalis treatment produced the largest amount of differential gene expression, and the genes regulated by the two pathogens overlapped substantially. For the top 500 differentially expressed genes observed at the acute to chronic time points, aortic tissue from ApoE-/- mice fed a normal chow diet was characterized by a balance of genes with increased and decreased expression; P. gingivalis treatment was skewed towards decreased expression (see Additional file 6: GeneLists). Because time-dependent differential expression was less robust in the C. pneumoniae-treated group, these changes may reflect inhibition of natural changes that occur with time in the aortic tissue from ApoE-/- mice fed a normal chow diet. Acute to chronic time point Venn diagrams. Venn diagrams depicting the number of genes with significantly increased (left) or significantly decreased (right) expression vs. the acute group for each chronic group. The sets of differentially expressed genes result from differential expression analyses for each acute group vs. its corresponding chronic group using the R environment for statistical computing (version 2.15.1) with a cut off of p < 0.05 as described in Methods. Using two-factor ANOVA, we then analyzed the capacity of either pathogen to alter normal time-dependent changes in gene expression that occurred in ApoE-/- mice. 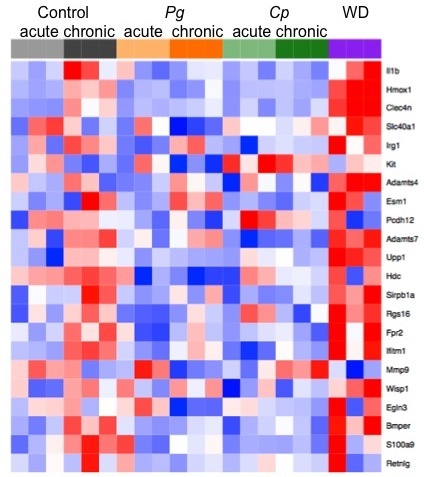 A clustering heat map of the 1000 genes with the strongest interaction effect between time and treatment is shown in Figure 4. At the arbitrary cutoff of 1000 genes, the ANOVA interaction (group:timepoint) FDR q value was < 0.117 and the p value was < 5.52 × 10-3. The expression of genes encoding myofibril, cytoskeletal, and ion binding/transport proteins (cluster 2) greatly increased over time in untreated ApoE-/- mice. However, treatment with either pathogen prevented or reversed this effect: the expression of these genes was increased and subsequently downregulated in the acute or chronic P. gingivalis-treated groups, respectively, and was unchanged in either C. pneumoniae treatment group. Conversely, the expression of a number of zinc-finger transcription factors (cluster 5) was downregulated over time in untreated mice, but was decreased and then subsequently upregulated in the acute or chronic C. pneumoniae-treated groups, respectively, and was unchanged in either P. gingivalis treatment group. A third noteworthy pattern was defined by a group of genes with functions in fatty acid metabolism and PPAR signaling whose expression was moderately downregulated over time in untreated animals (cluster 3); this downregulation was greatly amplified in mice treated with P. gingivalis but was completely abrogated in mice treated with C. pneumoniae (Additional file 7: Figure S4). Acute to chronic time point cluster analysis. The top 1000 differentially expressed genes for acute and chronic time points: the effect of group, time, and group x time interactions determined by two-way ANOVA are grouped into 5 distinct clusters. A. Heat map depicts relative expression among all groups and time points. Clusters are color-coded by row sidebars: red (cluster 1), chartreuse (cluster 2), mint green (cluster 3), blue (cluster 4), and magenta (cluster 5); and dendrogram is left of the color-coded sidebars. Each row corresponds to a gene (gene symbols are listed to the right of each row) and each column to a sample. The colors are scaled by row; red and blue indicate 2 standard deviations above or below the mean (white), respectively. At the arbitrary cutoff of 1000 genes, the two-way ANOVA interaction (group:timepoint) FDR q value was < 0.117 and the p value was < 5.52 × 10-3. B. DAVID analysis of clusters 2 and 5. Gene enrichment is indicated by p values (EASE scores, a modified Fisher exact p value). C. Box and whisker plots of the mean expression (log2) for Clusters 2 and 5 reflect patterns seen on heat map. ***p < 0.0001 vs. acute control; ###p < 0.0001 vs. chronic control; +++p < 0.0001 vs. acute treatment; ++p < 0.001 vs. acute treatment by Mann-Whitney test. As before, the 1000 genes with the greatest significance by one-way ANOVA across the three acute treatment groups (control, P. gingivalis, and C. pneumoniae) were assigned to several groups using hierarchical clustering (Additional file 8: Figure S5-1A). Acute treatment with P. gingivalis produced little differential gene expression, whereas acute treatment with C. pneumoniae resulted in large changes in gene expression. Genes whose expression increased with C. pneumoniae treatment (cluster 1) represented G-protein coupled signaling, viral myocarditis, antigen processing and presentation, and membrane genes. By contrast, nearly half of the genes whose expression decreased with C. pneumoniae treatment (cluster 5) encoded phosphoproteins, with the remainder encoding proteins involved in alternative splicing, the endoplasmic reticulum, and glycoproteins and secreted proteins. The remaining clusters were not remarkable due to lack of annotation to a DAVID pathway or of marginal significance (Additional file 8: Figure S5-1B). The three remaining clusters were not noteworthy (Additional file 9: Figure S5-2). A recent study identified 22 genes whose expression in the aortic tissue of ApoE-/- mice was associated with unstable plaque . We observed increased expression of several of these genes in aortic tissue from untreated ApoE-/- mice fed a normal chow diet, which represents the natural progression of atherosclerosis (Figure 5 and Additional file 10: Figure S6); and, in ApoE-/- WD mice, we observed an even greater increase in expression of some of these genes. P. gingivalis treatment blunted the increase in expression of some genes and induced the expression of others. Treatment with C. pneumoniae prevented the increase in all of the unstable plaque genes with the exception of Mmp9, which was increased over time in the C. pneumoniae-treated group but decreased over time in untreated ApoE-/- mice. Genes associated with unstable plaque. 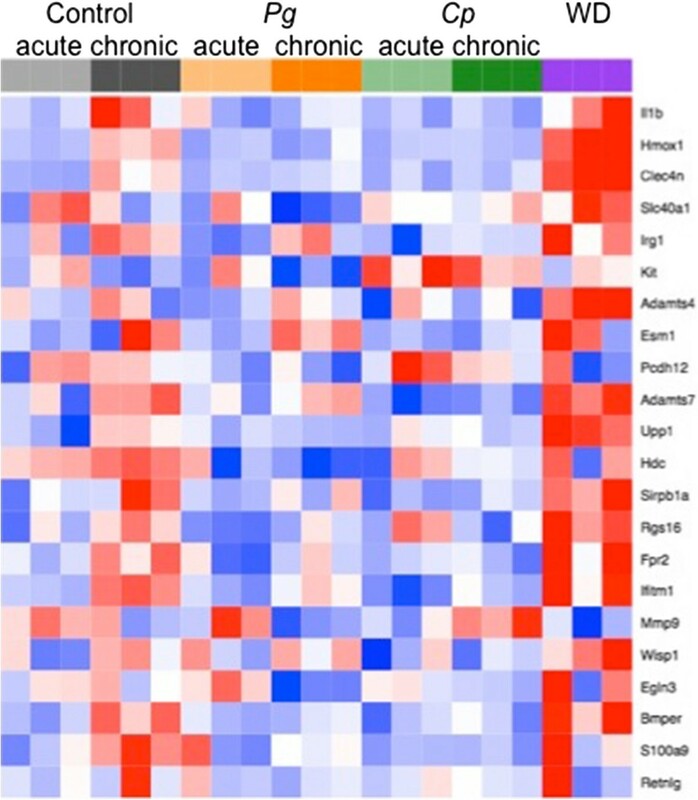 Heat map showing expression of genes associated with unstable plaque identified in Chen, et al. . In this study, we applied microarray analysis to define gene signatures in aortic tissues obtained from mice fed a Western diet (WD) or in mice treated with the oral pathogen P. gingivalis (P. gingivalis), or with the pulmonary pathogen C. pneumoniae (C. pneumoniae). Examination of gene expression profiles at the chronic time point enabled us to identify treatment-specific pro-atherogenic pathways rather than simply the genes expressed in established plaque. Our results in untreated ApoE-/- mice are consistent with a recent microarray study by Papadodima et al. that documented changes in gene expression in aortic tissue of ApoE-/- mice at three time points during the natural progression of atherosclerosis in the absence of additional pro-atherogenic stimuli. We identified common core sets of genes that were either increased or decreased in response to each of these pro-atherogenic stimuli. Contemporary analysis tools including GSEA and DAVID analysis were then applied. GSEA approach is more powerful than single gene analysis, which merely highlights the top up- or downregulated genes and may overlook effects on specific pathways . Pathway analysis showed a markedly greater number of gene sets that were different among the three pro-atherogenic stimuli, suggesting that underlying vascular inflammation and dysfunction leading to atherosclerosis differ mechanistically and in the functional pathways leading to atherosclerosis progression depending upon stimulus. These findings are significant in that this is the first study that has performed direct, side-by-side, comparison of genome-wide aortic gene expression changes in three well-recognized models of atherosclerosis development. Treatment with WD, P. gingivalis or C. pneumoniae has pro-atherogenic effects that include alterations in macrophage function, cholesterol homeostasis, and endothelial dysfunction [13, 33]. Signaling through innate immune Toll-like receptors (TLRs) expressed on immune cells and the endothelium may be a common link among the three stimuli; however, notable differences in TLR usage as well as features unique to each of the two pathogens may account for the differences in signaling pathways activated and repressed. TLR1, TLR2, and TLR4 RNA and protein are expressed at high levels in endothelial cells and macrophages in human atherosclerotic plaque biopsies and the lipid-rich atherosclerotic lesions in the aortic root of mice [34, 35]. A role for TLRs in high-fat-diet-induced atherosclerosis in animal models has been shown in studies using ApoE-/- TLR2-/- and ApoE-/- TLR4-/- mice. Interestingly specificity in TLR2 and TLR4 signaling by P. gingivalis and C. pneumoniae has been proposed to define specific inflammatory pathways unique to each organism [36–43]. P. gingivalis expresses heterogeneous LPS lipid A structures that weakly activate TLR4 but can also act as a TLR4 antagonist [44, 45], resulting in alterations in signaling through TLR4 that promote low-grade, chronic inflammation at distant sites including the aorta . C. pneumoniae induces its proinflammatory signaling primarily through TLR2 but also expresses LPS and signals through TLR4 . The unique feature of C. pneumoniae is that it gains entry into monocytes as elementary bodies (EBs), which are infectious but metabolically inert. After entering macrophages or monocytes, EBs can rapidly differentiate to a replicative form known as reticulate bodies (RBs), and start bacterial replication . RBs use the host’s metabolic metabolism and may find a favorable environment within a lipid-laden plaque to complete its replication. Infected monocytes may circulate to distant sites to promote vascular inflammation . C. pneumoniae may increase adherence of macrophages to endothelial cells through expression of its virulence factor, HSP 60, which has been shown to promote monocyte attachment to endothelium, and to promote extravasation to sub-endothelial layer, where it oxidizes LDL and promotes foam cell formation [50, 51], a hallmark of atherosclerosis. Most published studies involving animal models of atherosclerosis have used high dietary lipids and cholesterol (various modifications of Western style diets), and these studies have formed the basis for consensus around the mechanisms underlying the development of atherosclerosis. As a result, the use of statin drugs, which target cholesterol and lipid handling, are the most widely used class of drugs in the field of cardiovascular medicine. A recent study in Circulation  showed that despite the improvement of risk with optimum statin therapy in patients with cardiovascular disease, many patients demonstrate atheroma progression and additional cardiovascular events, suggesting that additional mechanisms are at play, highlighting the need to identify novel therapeutic strategies that combat the additional cardiovascular risk. Recent research implicates vascular inflammation and endothelial dysfunction as a factor involved in the initiation, progression, and instability of atherosclerotic plaques and elevations of serum inflammatory biomarkers consistently associated with the risk of experiencing a cardiovascular event, providing further evidence for systemic inflammation involvement in atherosclerotic cardiovascular disease . Given the prevalence of diet-induced obesity and infection with P. gingivalis and C. pneumoniae in the general population and the likelihood of co-morbidity of obesity with chronic or recurring infection with these common pathogens, these findings suggest that the development of atherosclerosis in humans is likely more complex and multifactorial than previously appreciated. Atherosclerotic plaques undergo both progressive and regressive changes, which affect their size and stability; regression in lesion area can increase plaque stability. Plasma cholesterol lowering has been associated with regression, and a recent study identified PPAR-gamma as a “master regulator” of regression in early lesions . Our GSEA analysis showed that C. pneumoniae treatment upregulated the PPAR pathway while P. gingivalis treatment downregulated this pathway and thus may indicate a role for C. pneumoniae in regression and stability of early lesions, while P. gingivalis may inhibit plaque regression. P. gingivalis decreased pathways involved in mitochondrial function, suggesting that P. gingivalis promotes mitochondrial dysfunction, which is associated with cardiovascular risk, vascular dysfunction and plaque development . Western diet group had significant reduction in tight junction pathways and expression of genes encoding claudins, proteins involved in maintenance of cell-cell junctions. This finding is consistent with a recent study that showed that Western diet promotes atherosclerosis in part via loss of tight junction control . A surprising finding from the present study was that immune and inflammatory pathways were markedly upregulated in response to Western diet. It has recently come to light that certain lipids in Western style diets are either endogenous ligands of TLRs or assist with pattern recognition of TLRs [55, 56]. Consistent with this, prior studies have shown that TLR2, TLR4, and MyD88 knockout mice on an ApoE-/- background had decreased atherosclerotic aortic plaque in response to a Western diet [36, 38, 39]. A recent microarray study by Hyvarinen et al., compared gene expression in adipose tissue following chronic infection with C. pneumoniae and/or a periodontal pathogen, A. actinomycetemcomitans (Aa) and revealed significant enrichment in inflammation associated pathways by Aa or a combination of Aa and C. pneumoniae but not by C. pneumoniae alone as compared to a control group . Of interest was the increased expression of a number of genes associated with vulnerable plaque previously identified by Chen et al. in aortic tissues obtained from mice at the chronic phase compared to tissues obtained at the acute phase. These genes were Bmper, Hdc, Ifitm1, S100a9, Upp1, Adamts7, Fpr2, Clec4n, Hmox1 and Irg1. Our findings demonstrate that expression of these genes increases as part of the natural progression of atherosclerosis in ApoE-/- mice in the absence of an additional pro-atherogenic stimulus. Importantly, the increased expression of these genes was blunted at the chronic time point in mice treated with C. pneumoniae. 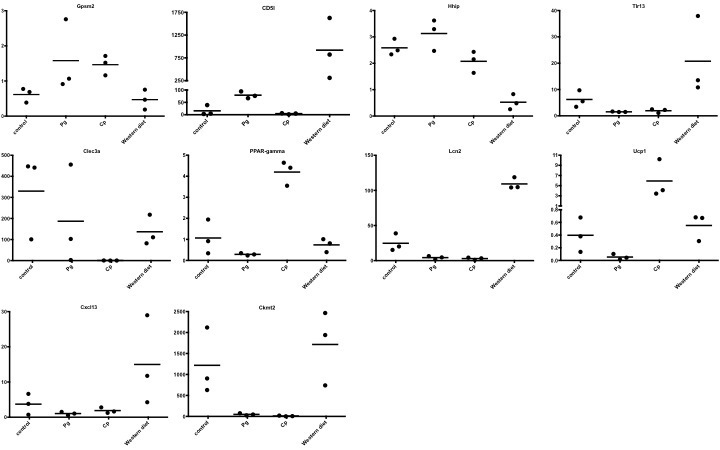 Expression of Kit was increased in the C. pneumoniae -treated group compared to the chronic control group. In addition, P. gingivalis treatment blunted the increase in expression of Bmper, Hdc, Ifitm1, S100a9, Upp1 and Hmox1. Expression of Egln3 was decreased in the P. gingivalis-treated group compared to the chronic control group. Expression of Clec4n and Hmox1 was increased in the Western diet group compared to the chronic control group. The identification of differences in the effects of each of the pro-atherogenic stimuli on expression of important vulnerable plaque genes may result in differences in the nature and composition of the atherosclerotic plaque, which will be explored in future studies. Several limitations of the study should be noted. We could not simultaneously perform a side-by-side quantification of the degree of the aortic plaque and the pathological features assessed by histology induced by the three atherogenic stimuli. We also could not determine the contribution of possible alterations in gut microbiota induced by each of the pro-atherogenic treatments or following antiobiotics pre-treatment in the P. gingivalis group. We could not validate our findings with regard to establishing that the pathways we identified are mechanistically linked to each pro-atherogenic stimulus at the protein level. We also acknowledge the limitations of using mouse models to draw conclusions about human diseases, which are more complex and multifactorial. Future studies will also investigate the effects of comorbidity with 2 or more pro-atherogenic stimuli, which resembles scenarios that occur clinically. The present study suggests that P. gingivalis treatment may promote atherosclerosis by stimulating mitochondrial dysfunction and inhibiting the egress of endogenous lipids from the vessel wall, whereas C. pneumoniae may promote atherosclerosis by enhancing lipid uptake and metabolism into the vessel wall, and WD may promote atherosclerosis by activation of inflammatory and immune pathways that enhance leukocyte adhesion and endothelial dysfunction. All experiments were carried out in accordance with the recommendations in the Guide for the Care and Use of Laboratory Animals of the National Institutes of Health and study protocols were approved by the Boston University Institutional Animal Care and Use Committee. All experimental procedures involving pathogenic bacteria were carried out with approval from the Boston University Institutional Biosafety Committee. Male ApoE-/- mice on C57BL/6 background (Jackson Laboratories) of 8 weeks of age were randomly assigned into a chronic exposure cohort and an acute exposure cohort. The chronic exposure cohort consisted of the following groups: P. gingivalis treatment (chronic P. gingivalis, N = 3), C. pneumoniae treatment (chronic C. pneumoniae, N = 3), WD (chronic WD, N = 3), and Control (N = 3). The acute exposure cohort consisted of the following groups: P. gingivalis treatment (acute P. gingivalis, N = 3), C. pneumoniae treatment (acute C. pneumoniae, N = 3), and Control (N = 3). Mice were fed a normal chow diet (Global 2018; Harlan Teklad, Madison, WI) with the exception of the WD group. Control mice received no additional treatment after randomization and assignment to groups. Mice in the chronic exposure cohort were euthanized 9 weeks after the last bacterial treatment or after 9 weeks on WD; this represents a time point prior to the development of overt aortic plaque as observed approximately 13 weeks following P. gingivalis, C. pneumoniae, or WD [8, 11, 12, 46, 58–64]. Mice in the acute cohort were euthanized one day after the last bacterial treatment. 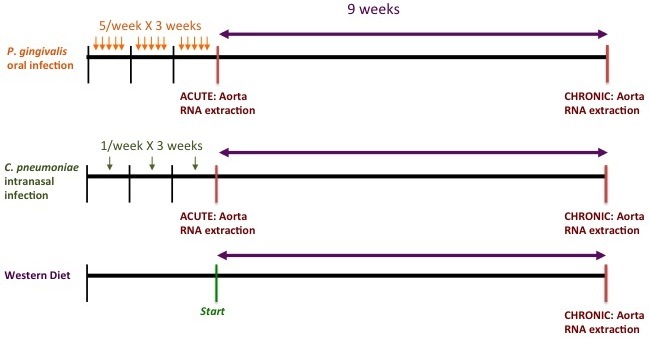 At the end of each study period, the aortas were dissected and aortic RNA was isolated and used for microarray analysis to compare the acute and chronic responses of the pro-atherogenic stimuli on transcriptional profiles (For experimental protocol, see Additional file 11: Figure S7). P. gingivalis strain 381 was grown anaerobically on blood agar plates (Becton Dickinson) and used to seed-inoculate brain heart infusion broth (pH 7.4; Becton Dickinson) supplemented with yeast extract (Becton Dickinson), hemin (10 μg/ml; Sigma), and menadione (1 μg/ml). CFUs were standardized at an OD of 1 at 660 nm (equivalent to 1 × 109 CFU/ml) by spectrophotometry (ThermoSpectronic Genesys20). The protocol for P. gingivalis oral infection of ApoE-/- mice was as previously described by our group and characterized for the acceleration of atherosclerosis progression [8, 10, 58]. Briefly, mice were given antibiotics (Sulfatrim; Hi-Tech Parmacal) ad libitum in the drinking water for 10 days followed by 2-day antibiotic-free period. Mice were then given one hundred μl of P. gingivalis (1 × 109 CFU) suspended in vehicle (2% carboxymethylcellulose in PBS), topically applied to the buccal surface of the maxillary gingiva 5 times a weeks for 3 weeks . We have previously shown that oral treatment with P. gingivalis using this protocol results in increased serum levels of P. gingivalis-specific IgG1, IgG2b, IgG2c and IgG3 . C. pneumoniae strain AO3, initially isolated from a human atheroma, was provided by Dr. Charlotte Gaydos (Johns Hopkins University, Baltimore, MD). Cp were propagated in L929 fibroblasts grown in RPMI 1640 medium supplemented with 10% FBS at 35°C in a 5% CO2 environment as described [66, 67]. Following infection of fibroblasts, cells were harvested and disrupted by glass beads or sonication (Sonicator 4000, Misonix Sonicators, Newtown, CT) and Cp separated from cell debris by ultracentrifugation through 32% Renografin. Bacterial titers were calculated as inclusion forming units (IFU) per milliliter. Chlamydia stocks were negative for Mycoplasma contamination . ApoE-/- mice were inoculated as previously described  with C. pneumoniae via the intranasal route under light anesthesia using a ketamine/xylazine mix (60–100/5–10 mg/kg i.p., respectively). Mice received 20 μl bacterial suspensions in phosphate buffered saline (PBS) containing 2 × 106 IFU gradient purified Chlamydia. Mice received intranasal infection once a week for 3 weeks. Others have previously shown that intranasal treatment with C. pneumoniae using this protocol results in dissemination of C. pneumoniae from the lung to aortic plaques as detected by immunohistochemistry and PCR [63, 64]. The WD ApoE-/- mouse group received Teklad Adjusted Calorie Diet (42% from fat) (Harlan Catalog # 88137; 0.2% cholesterol) ad libitum, a diet that accelerates atherosclerosis in ApoE-/- mice [59–62]. Following euthanasia, the thoracic aortic with the three major branches (innominate, left common carotid, left subclavian arteries) was removed for RNA extraction as follows. On ice, the thoracic aorta was dissected from extraneous tissue. Immediately following dissection, the aorta was placed in a cryotube and stored at -80°C for RNA extraction and analysis. Total aortic RNA was isolated using TriZol extraction reagent (Invitrogen) following homogenization using TissueLyser II in pre-cooled blocks (Qiagen, Valencia, CA). RNA was further purified using the RNAeasy kit (Qiagen, Valencia, CA). Sample integrity was verified using RNA 6000 Pico Assay RNA chips run in Agilent 2100 Bioanalyzer (Agilent Technologies, Palo Alto, CA). Total RNA (5 ng) was reverse-transcribed using Ovation Pico WTA System V2 (Nugen, San Carlos, California). The obtained SPIA-amplified cDNA was purified using Agencourt RNA clean XP Purification Beads and fragmented (5 ng) and labeled with biotin using the Encore Biotin Module (NuGEN, San Carlos, California). SPIA-amplified cDNA and fragmented cDNA quality controls were performed by running an mRNA Pico assay in the Agilent 2100 Bioanalyzer. Labeled, fragmented DNA was hybridized to a Mouse Gene 1.0 ST Array (Affymetrix, Santa Clara, CA) for 18 hours in a GeneChip Hybridization oven 640 at 45°C with rotation (60 rpm). The hybridized samples were washed and stained using an Affymetrix fluidics station 450. After staining, microarrays were immediately scanned using an Affymetrix GeneArray Scanner 3000 7G Plus. Raw Affymetrix CEL files were normalized to produce log2-transformed, Entrez Gene-specific expression values using the implementation of the Robust Multiarray Average (RMA) in the affy package in the Bioconductor software suite (version 2.12) and an Entrez Gene-specific probeset mapping from the Molecular and Behavioral Neuroscience Institute (Brainarray) at the University of Michigan (version 14.0.0). Array quality was assessed by computing Relative Log Expression (RLE) and Normalized Unscaled Standard Error (NUSE) using the affyPLM Bioconductor package (version 1.34.0); all arrays had median RLE and NUSE values less than 0.1 and 1.05, respectively, indicating that they were of sufficient quality. Principal Component Analysis (PCA) was performed using all genes after z-normalizing expression values to a mean of zero and a standard deviation of one across all samples. Differential gene expression between each experimental treatment group and the control group within each time point (acute time point: P. gingivalis or C. pneumoniae vs. control; chronic time point: P. gingivalis or C. pneumoniae or WD vs. control) was assessed using the empirical Bayesian (moderated) t test from the limma package (version 3.14.4). Differential gene expression between chronic and acute time points within each applicable treatment group (control, P. gingivalis and C. pneumoniae) was assessed as above. Analyses of variance were performed using the f.pvalue function in the sva package (version 3.4.0). Correction for multiple hypothesis testing was accomplished using the Benjamini-Hochberg false discovery rate (FDR) [68, 69]. Human homologs of mouse genes were identified using HomoloGene (version 65) [PubMed ID 23193264]. All microarray analyses were performed using the R environment for statistical computing (version 2.15.1). Ten genes were selected for validation of microarray expression levels using Taqman Inventoried Assays and Real Time RT-PCR. RNA isolated from the same aortic tissue used for the microarray was converted to cDNA using the High Capacity cDNA Synthesis Kit (Life Technologies). Real-time relative PCR was performed on cDNA using Taqman-validated exon-spanning assays and Gene Expression Master Mix (Invitrogen) on a StepOne System and software (Life Technologies Applied Biosystems). Genes chosen for validation were those with expression levels that were representative of various patterns of expression (increased expression, decreased expression, no change in expression) in each of the treatment groups relative to control. Validated genes and their assay number were peroxisome proliferator-activated receptor gamma (PPAR-gamma, Mm01184322_m1), CD5 molecule-like (CD5l, Mm00437567_m1), lipocalin 2 (Lcn2, Mm01324470_m1), hedgehog interacting protein (Hhip, Mm00469580_m1), C-type lectin domain family 3, member A (Clec3a, Mm01240105_m1), chemokine (C-X-C motif) ligand 13 (Cxcl13, Mm00444533_m1), G-protein signaling modulator 2 (Gpsm2, Mm00512842_m1), uncoupling protein 1 (Ucp1, Mm01244861_m1), creatine kinase, mitochondrial 2 (Ckmt2, Mm01285553_m1), Toll-like receptor 13 (Tlr13, Mm01233818_m1). Gene expression was normalized to expression of beta-actin for each sample and expressed as fold change to a control sample. Expression levels of beta-actin were similar in all samples (ANOVA p = 0.65, NS). GSEA was used to identify biological terms, pathways, and processes that were overrepresented among the genes that were up- or down-regulated with respect to various pairwise comparisons. A list of all Entrez Gene identifiers (Entrez Gene IDs) interrogated by the array was ranked according to the moderated t statistic, and this list was then used to perform a pre-ranked GSEA analysis using the publicly available Molecular Signatures Database (MSigDB, version 3.0, http://www.broadinstitute.org/gsea/msigdb/). Gene sets corresponding to 1625 biologically defined gene sets representing pathways, locations, or functions were derived from the following public databases: Kyoto Encyclopedia of Genes and Genomes (KEGG), Gene Ontology (GO), Biocarta, and Reactome [29–31, 70]. To control for multiple comparisons in GSEA analysis, Benjamini-Hochberg False Discovery Rate (FDR) correction (FDR q) was applied [68, 69]. The Database for Annotation, Visualization and Integrated Discovery (DAVID) v6.7 gene annotation tool was used to understand biological meaning for gene lists identified by clusters and GSEA [71, 72]. Statistical analyses for non-microarray data (Taqman validation, box and whisker plots, and analysis of vulnerable plaque genes) were performed using GraphPad Prism 5.0 software. Comparisons among groups were performed using ANOVA followed by a 2-tailed unpaired Student’s t-test or Mann-Whitney U test. The data set supporting the results of this article  is available in the Gene Expression Omnibus (GEO) repository, the Series record ID is GSE60086 and the private link is: http://www.ncbi.nlm.nih.gov/geo/query/acc.cgi?token=mvchagcyhfgtrit&acc=GSE60086. CAG is the PI of a P01 grant entitled “Role of innate immune system in pathogen induced chronic inflammation” (NIH NIAID AI078894), with FCG, JEF, RRI, CAG as PIs of individual projects. YA is the director of the BU Microarray Core Resource facility, and ACG is a bioinformatics scientist in the BU Clinical and Translational Science Institute (CTSI). Carolyn D Kramer, Ellen O Weinberg contributed equally to this work. CTSI grant UL1-TR000157 funded the microarray experiments and analysis, NIH NIAID AI078894 provided funding for EOW, XH, SM, LMB, LW, FCG, JEF, RRI, CAG, NIH T32HL007224 provided funding for CDK, NIH NIAID T32AI089673 provided funding for CS. ACG and YA are funded through Boston University CTSI. CDK and EOW designed and performed the study, analyzed microarray data, performed and analyzed assays, performed statistical analysis, wrote and edited the manuscript; ACG analyzed microarray data and critically evaluated and revised the manuscript; XH, SM, CS, LMB performed experimental protocols and assays; LW, FCG, JEF, RRI designed the study and critically evaluated the manuscript; YA oversaw the microarray studies; CAG conceived of and designed the study and critically evaluated the manuscript. All authors read and approved the final manuscript.